On another level it was also rather pathetic. The Internet has touched yet one more part of society, the airplane, one of the last quiet corners of the globe. I faced the beast and gave in without a fight. I could not resist the temptation to touch the Internet on an airplane. I could not resist the online addition for even four hours. Like all addicts, I really enjoyed the experience while it lasted, but after it was over it made me wonder about myself. I purchased the service on an American Airlines flight. 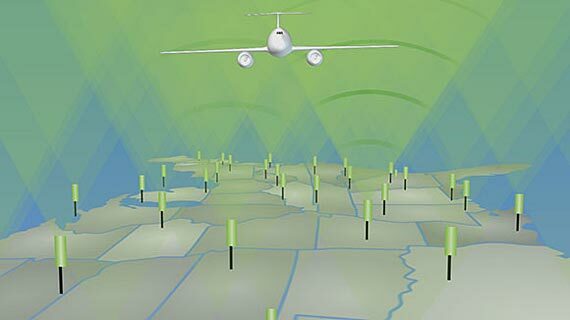 The service was called “Gogo Inflight Internet,” and it is operated by a company called Air Cell. According to their web site, American has put the service on its 767s, which was the plane we flew between Chicago and San Fran. They claim to offer the service on half their flights. American Airlines does not seem to be the only airline that has begun to deploy this service. So too has Air Canada, AirTran Airways, Delta Airlines, Virgin Airlines, and – coming soon – US Airways. I looked into the matter, and it seems Southwest airlines also plans to deploy a service, but using a different company than these others. American charged $12.95 for Wifi service between Chicago and San Francisco. A few days later I learned that this price changes on shorter flights. I took another flight between Chicago and Boston, and the charge was $4.95. A month pass costs $30, so the road warrior can just buy once and go with that. Back to the main point. The price, $12.95, seemed rather pricey at first and I decided not to buy. I gave in, however, about an hour after the attendants gave the passengers permission to use approved electronic devices. Specifically, my kids were on their best behavior, finding a way to entertain themselves, so I pulled out my laptop and started to finish a draft of a paper. Next thing I knew, I wanted to communicate with a coauthor, look up some information on the web, and conduct my normal business. So I plunged. I logged in on the plane, and bought the service. It was easy. It took about five minutes. I read the terms and conditions, saw nothing evil, and pressed “buy.” (In case you are curious, the service comes with one main condition. The company forbids the user to employ Skype – though it was readily unapparent why they had this condition, or how this condition could be enforced). I must confess one thing. I also was curious. I wanted to see how it worked. So here is a review. The service itself was no big shakes. Well, what do you expect at 35 thousand feet? Here are the details: It uses an air to ground technology based on CDMA EVDO. Do not get me wrong. This service could be very fast. It just was not most of the time — at least not most of the time on the particular day in the particular plane I happened to ride. How fast was it? Think of it this way. It was faster than dialup, but often it was slower than most hotel wifi. Most hotel “high-speed” wifi is not very speedy, so that is saying something. To be honest, wifi on wings had one weird quality: the speed varied. At rare moment it was lightening fast (yes, even faster than hotel “high-speed” wifi), but at other times it was molasses slow, reminding me of the Internet on 14.4K. It handled email ok, but a big attachment produced delays. Browsing did not meet with long uploads most of the time, but a few times merely refreshing the page met with long delays, and for no apparent reason. Then something really weird happened. Near the end of the flight the service got very fast, lightening fast. The last ten minutes of service was spectacular. I guessed that I was sharing a little pipe or antennae with all the other users on the plane, and that produced the bandwidth bottleneck I experienced as a slow page refresh. I did not like this mix of fast and slow. When I surf I get into a rhythm, and these unanticipated delays disturbed that. In other words, if I know a connection will be fast, then I multitask with the best of them. But when it varies between fast and slow, it is hard to pace at any rhythm. I end up daydreaming too much during the slow moments. 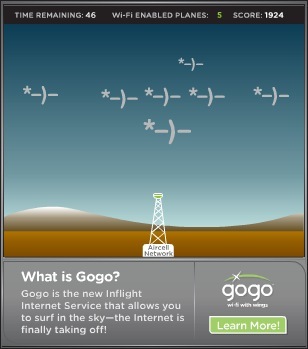 Actually, speaking of slogans, Gogo seems to have trademarked an emoticon which is supposed to resemble an airplane. During another day dreaming moment I stared at this emoticon because, at first, I did not get it. If you are like me and you do not get the point of this emoticon, just stare at it for a while. The asterisk is the back tail of a plane, and the parenthesis is the wing. Maybe it is just me, but trade-marking an emoticon seems like a very nerdy thing to do. It is the sort of geeky thing that Internet junkies like. It makes for a good classroom story too. But I am at a loss as to how it will appeal to the common person. Look, get the point? The service is great for email and surfing if you really need it, and it works for plenty of other stuff, but every now and again, it slows to a crawl. So be prepared to daydream. 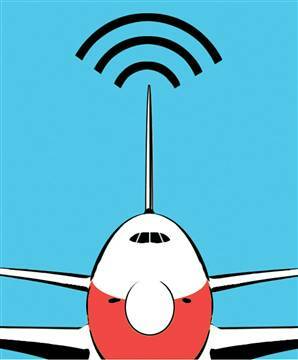 From news reports it appears that outfitting a plane for wifi is not cheap. One report put the expense at $100K. During another slow moment I did a little calculation. How fast will the $100K be recouped? Consider this. If the average cross country plane makes three trips a day, and gets an average of 10 paying customers from all three flights, then it has collected $130. That means it will take 770 days to collect $100K (which does not include the interest cost of borrowing), which is just over two years. I have no idea whether planes will average 3 paying customers a day or 30, but at this point I bet Air Cell and the airlines have no idea as well. My only point is simple, that 10 is an obtainable number. After all, many plane flights contain lawyers and consultants and senior executives for whom $12.95 is nothing, and saving time is everything. To be sure, that is not the end of the financial case. There are towers on the ground too. Those cost something to set up, not to mention monitor and service. And there are backhaul charges for the data traffic, which has to be passed to an ISP. Air Cell has to recoup those investments at some point. That is not the only financial incentives. There is also a wondrous amorphous strategic benefit, which the airline might reap, if the presence of this service moves the market share for their tickets. Increasing even a few first class tickets, for example, implies enormous benefits. But here is the interesting twist. If offering this service increases market share, then the increase is offensive. If offering the service prevents the firm from losing market share to another, then benefit is defensive. The former shows up as an increase in revenue, while the latter manifests as a decrease that does not occur. In short, it does not stretch reality to imagine that this investment will generate enough revenue to pay this back. That seems well within the range of plausible and profitable. The key open question is demand – as in, will fliers subscribe to this service in sufficient numbers to pay back the investment of the airline and Air Cell? More narrowly, this discussion makes me wonder how the airlines and Air Cell are contractually splitting the investment and risks here. Does anybody out there know? Actually, all this leads to my last remark, about how pathetic I was on this trip. The trip was a personal trip for a family event, but I had numerous business obligations barreling on top of me. I deluded myself into thinking I was curious, but, truthfully, I rented the service as a way to get a revised manuscript to a co-author. Why is that pathetic? Because – well, how do I say this? – Just like about every other senior colleague I know, I get almost no quiet time in my office. As a result, I look forward to plane trips. They are one of the few places during a normal week where I can have sustained peace and quiet for a few hours – no phone calls, no email, no knocks on the office door, no administrative crises to address. I like to joke sometimes that plane trips are one of the few places in which I can read an entire paper cover to cover without interruption. It is just too bad the air quality is so bad and the air pressure is so light inside airplanes, because otherwise I would be able to hear myself think. In fact, my normal day has reached a sad state. Even on a little family trip on a plane I pull out my laptop and try to get in a few extra hours. That is pathetic. Look, it is not Gogo’s fault. They are just trying to make a buck off my addiction and the addiction of others. That does not help make their service feel like less of an intrusion into sacred ground. As I said at the outset, like an addict’s remorse after a high, I am looking back on this event and wondering about it. *sigh* The great Internet temptation has invaded one of the last quiet spots on earth, the stratosphere. I am not sure this is all for the good.